Just in time for those New Year resolutions, Pic the Gift has released their new personalized Sport Bottle. These bottles can be designed to incorporate a logo for sports teams, company events, or promotional products. The new year is here and everyone is making their New Year's resolution. For those who made their resolution to lose weight or to become more green, Pic the Gift has just the product. Pic the Gift is proud to announce their new Personalized Sport Bottle that can help aid in New Year resolutions for 2015. 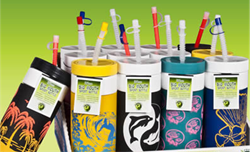 The Sport Bottle holds 32 ounces of liquid and includes a white lid, clear straw with a cap, and an insulator sleeve. The opening is large enough to allow easy filling of ice, and the bottle is top rack dishwasher safe. The plastic the bottle is made out of is Biodegradable, CPSIA Certified, Recyclable, FDA and Phthalate free, as well as BPA-Lead Free. The product is also 100% made in the USA. Pic the Gift’s online designer allows anyone to become an artist with ease. Upload images, backgrounds, pictures, fonts, or designs from the online designer, Facebook, Instagram, or personal files to create a masterpiece. Pic the Gift offers stock images, clip-art, backgrounds, fonts, and special features that will create a totally customizable bottle! Be sure to follow the instructions on the template for best placement of logos and designs. These bottles can be designed to incorporate a logo for sports teams, company events, or promotional products. No matter what the sports bottle is being used for, customers can create a sport bottle that will be durable and vibrant for years to come. For 50 years in St. Louis, Missouri, every product from Pic the Gift has been made in America! Pic the Gift produces high quality personalized products and picture gifts. Making every customer “WOW” is their main goal by creating the most astonishing personalized and customized gifts! For more information or the full product line of customizable gifts, please visit http://www.picthegift.com.